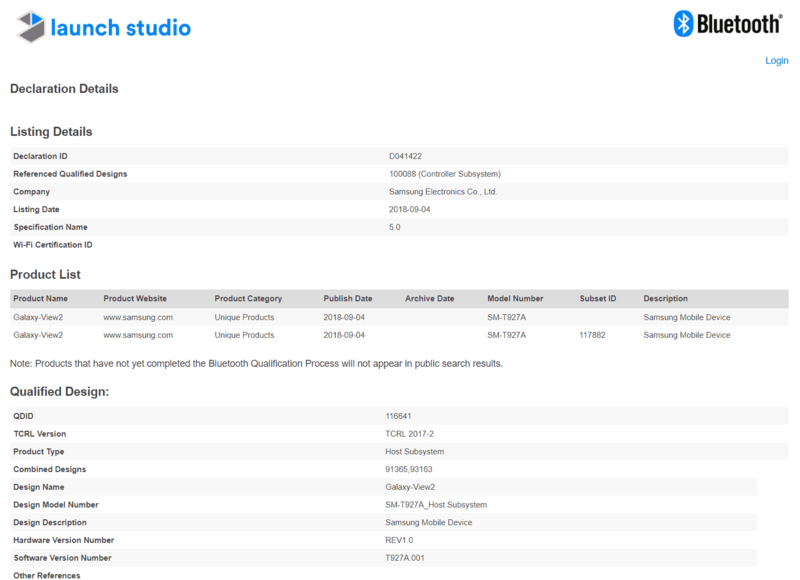 Samsung is probably gearing up to add another device to its Galaxy View line of tablets, considering it has already received certifications from Bluetooth and Wi-Fi organizations. The Galaxy View 2 bearing model number SM-T927A has passed through both Bluetooth SIG and Wi-Fi Alliance (WFA) in the last few days indicating a possible launch in the coming weeks. 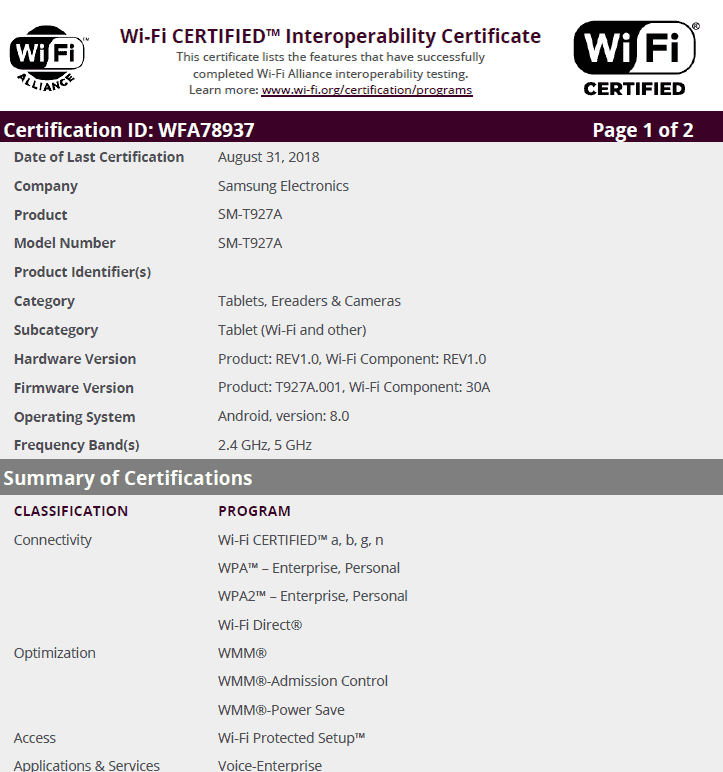 While WFA’s website only mentions the tablet’s model number, the Bluetooth certificate actually confirmed the Galaxy View 2 name for the unannounced Samsung tablet. From these certificates, it is learned that the tablet will come preinstalled with Android 8.0 Oreo most certainly with Samsung’s own skin running on top and will support dual-band Wi-Fi on 2.4GHz and 5GHz frequencies along with Bluetooth 5.0. Going by the included model number SM-T927A, the tablet will possibly be available via AT&T in the U.S., and even a report backing this speculation surfaced late last month. The report cited some sources with knowledge of the matter to claim that the tablet will be picked up by AT&T and will be marketed with the name Galaxy View 2 as a direct successor to the Galaxy View. The first-generation tablet debuted in 2015 but its sales graph didn’t reach the expected heights, leaving Samsung with no other option than to abandon the series for a while. Now almost after three years, the South Korean tech giant is planning a successor for the tablet that will reportedly include a tad smaller display. The Galaxy View 2 is expected to launch with a display measuring 17.5 inches diagonally, a reduction of about an inch when compared its predecessor. This step should reduce the tablet’s overall footprint and weight by a bit making it slightly easier to move around occasionally, though it might be meant to be used as a stationary family media consumption hub. Samsung might retain the 1080p display and is said to include an Exynos processor paired with 3GB of RAM, but an official confirmation has yet to be made in this regard. Some prominent Samsung features like S-Pen and DeX mode won’t be supported by the upcoming tablet, even though they could’ve brought some added productivity features especially given its vast display area. There is still no word on its pricing but the company may announce the Galaxy View 2 close to the $600 launch price of its predecessor. QUIZ: Which Teenage Mutant Ninja Turtle Are You? You are reading an article on the Samsung Galaxy View 2 Tablet Certified For Bluetooth & Wi-Fi. All materials on the site Gadgets F, а также и статья Samsung Galaxy View 2 Tablet Certified For Bluetooth & Wi-Fi - written for the purpose of information enrichment and we are happy if you like our magazine.